This is Masao Gunji. 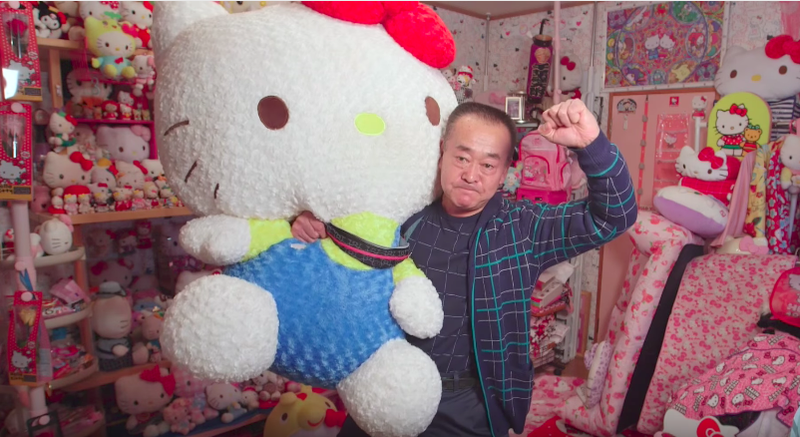 For the past 35 years, he has been collecting Hello Kitty stuff. He has amused the largest collection of its kind. Recently, Gunji was on Japanese television talking about his collection, saying that if he goes to the same shop, he ends up buying Hello Kitty that’s still on the shelf. He said he thinks it’s so sad that those items haven’t been sold and wonders why nobody has purchased them. Gunji is a Guinness World Records holder for Hello Kitty stuff. By a 2016 count, he had over 5,000 Hello Kitty goods (5,169 to be exact). Gunji’s wife helps him complete his collection, buying Kitty goods when she can. “Hello Kitty has always cheered me up when I was unhappy.” No doubt he does the same for Hello Kitty license holders.